Description:- "CCM tablet is balanced mix of Calcium Citrate Malate, Cholecalciferol (Vitamin D3), Folic Acid. Calcium Citrate malate show higher water solubility & offers highly bioavailable calcium.Calcium plays a very important role in the body. It is necessary for normal functioning of nerves, cells, muscle, and bone. If there is not enough calcium in the blood, then the body will take calcium from bones, thereby weakening bones. Thus intake of Calcium is necessary to keep the bones strong. Cholecalciferol (Vitamin D3) increase calcium absorbtion and strengthen bones Folic acid is a important Nutrient for women & pregnant women. Folic acid functions in DNA synthesis and cell division. Without this important vitamins, red blood cells fail to divide properly. CCM tablet is is beneficial for Pregnant and lactating women, Post menopausal women, Elderly people and in Calcium deficiency states. 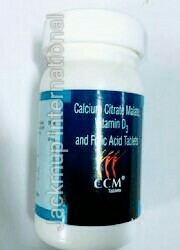 CCM tablet is also used in Osteoporosis, Osteomalacia & Fractures."